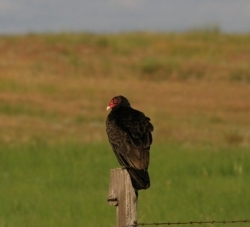 Turkey Vultures normally nest in dark caves along rivers and lakeshores. These are in very limited supply. In the past twenty years, but especially the last five years, these vultures have learned to nest in a different kind of cave, the dark corners (such as previous clothes closets) in attics of deserted farmhouses. This new habit has extended their range, and they have increased in numbers. We wished to learn more.